Join me as I try all the wrong ways to make Citrus Slice Soap and finally stumble upon an easy method to make these summery little beauties. Is the citrus soap tutorial complete now? 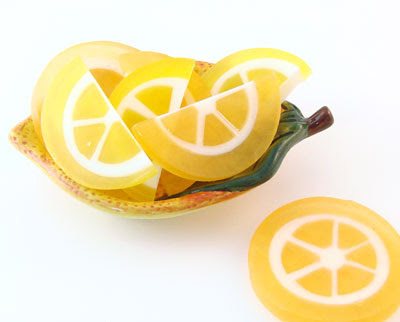 I was hoping to see soaps like the perfect citrus slices on your blog. I’ve tried this oh so long ago with not so great results. These look great. Looking forward to the tutorial! These look fabulous ! I am jealous ! I’m so impressed, those are so lovely! That’s impressive! I can’t wait to see how you did it! 🙂 Even the before pictures would be complex for me, LOL! I’m a total noob at this. Picture #1 looks like something I have in my own portfolio. I can’t wait to be taken to picture #2! Those look juicy, yummy! Oh my! That is a wee bit of a difference. I will call your ‘befores’ mosaic soap. Ooooh, that would be fun to make! Me, too! I can’t wait to hear the details. The soaps look beautiful! Wow! these make me want to try melt and pour! Oooh I can’t miss this lesson! Your results are simply beautiful. I’m looking forward to your journey from before to after. They look fabulous! They look great….looking forward to learning how to make them. 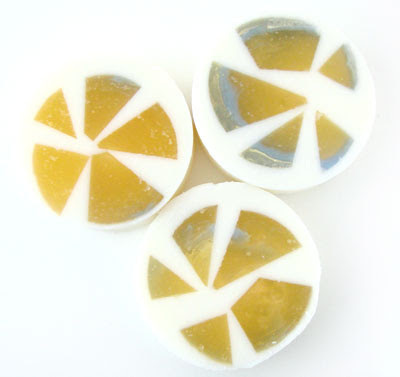 Mmmm, citrusy soaps! They look like those gummy fruit candies. Would love your secret.